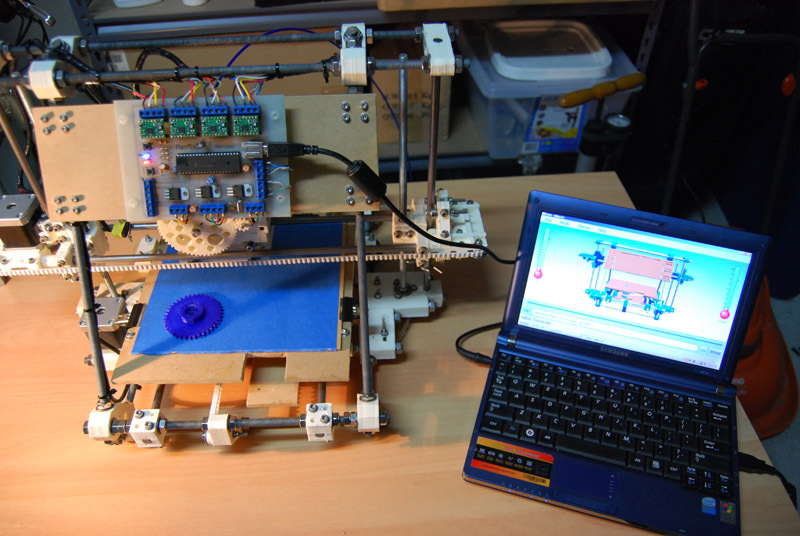 This page is a blog of my first RepRap build, made over a period of about seven months. If you don't know what a RepRap is then head over to reprap.org, basically it's a machine capable of printing 3D objects; including many of the parts needed to build itself. I've spent the past couple of days porting the official RepRap firmware to a managed C++ class library which is linked to my front end. I've also written some graphics code for rendering plastic extrusion and hooked it up to the firmware. The result is a 3D "Virtual Mendel" which I can now use to load gcode files and visualize the animated print before committing to plastic. This is extremely handy for examining the internal features of print parts, which is something I need to do with my RP parts because many of the holes are filled in and need drilling. It also means I can be reasonably confident that my plan of running the official firmware host-side and transfering the binary drive data across my USB link will actually work. Finally, it will come in handy if I ever plan to work on modifying/improving the official gcode generation code. While working on all this I discovered a null-pointer dereference bug in the official firmware which I reported to the dev group. I provided a patch on request and it's been applied to the official firmware.